Kiva Update A portion of funds raised from every project are used as micro-loans in areas of the world chosen by the kids from each project. From 2011-2012 alone, we donated to business men and women in Ghana, Philippines, Azerbaijan, Senegal, Tajikistan, Mongolia, Iraq, Honduras, and Indonesia through Kiva. Two thirds of our loans have been repaid with only a 2% delinquency rate. We are so happy to welcome a newly initiated group to Kids 4 Change! Our new K-2's, Reuben, Sloan, Paige, Abigail, and Avery, voted to help our marine environment by doing a beach clean up and getting donations per bag of trash. The $200 they raised will go to the Marin Marine Mammal Center where we have adopted a Dolphin, an Otter and a Seal. The day at Linda Mar Beach was a big success- the kids found 5 pairs of shoes, a barbie and 7 bags of trash! Their micro-loans have gone to three recipients in Mongolia who will be using the funds to send themselves or their daughters to school. Good job everyone! The launch of the first Kids 4 Change Sea Crest project was an enormous success! We were so impressed with the kids! They were creative, engaged and compassionate. As usual, we first learned about the democratic voting process. After some fabulous brainstorming, the kids used their new-found knowledge of voting to choose a project benefitting sick children. They decided to host a bake sale and thanks to the support of Sea Crest kids and parents, Kids 4 Change raised over $320! This money has also gone to benefit three business people in Peru: an organic cocoa farmer, a market stall owner and the owner of a clothing shop. During our last session, the children learned about their borrowers' businesses and the Peruvian culture. We played a kid’s game called Sapo, throwing coins into a frog’s mouth, we tried on traditional Peruvian dress, snacked on rice pudding* and read a book on Peru. After creating some "get well" cards to accompany their check to a children’s hospital, the kids were presented with Certificates of Completion of their first K4C project. It was a "thumbs-up" experience! Thanks to Mrs. Hanepen for making it happen and to the Sea Crest community for your generous donations. 4. Add rice, stir until water boils again- reduce heat to simmer. Do not cover. 5. Split vanilla bean, scrape pulp into rice. Add bean. 9. Cook until mixture reaches pudding consistency, pour into serving dishes, sprinkle with cinnamon and serve. 10. Pudding may be refrigerated and served cold. Keeps up to 5 days. It was a wonderfully fun and successful project! The kids decided to help our local animal shelter, and boy, did they ever! We set up a drop off point for items of all kinds, from reptile baths to things for bunnies to chew and everything in between. 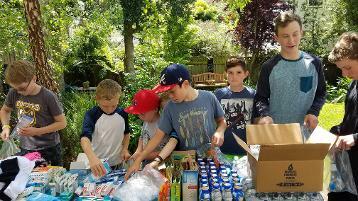 The kids sold baked items for humans (and dogs), and raised over $400 in funds, and more than 10 large boxes of supplies for the animals. They took shifts waving signs, manning the booth and chatting with people and pets who dropped by. What an incredible combined effort! Thank you to everyone who dropped off items and who made a donation. It has made a BIG difference at the SPCA. We thank you for your continued support of Kids 4 Change... educating kids that even small acts can improve the lives of others! 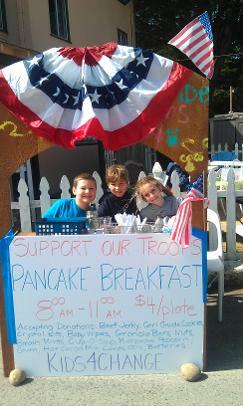 Kids 4 Change hosted a pancake breakfast to raise funds and collect donations to send care packages to our soldiers. An enormous thanks to P-Town Cafe for the fabulous location and support- we had some great foot traffic and grossed almost $500. 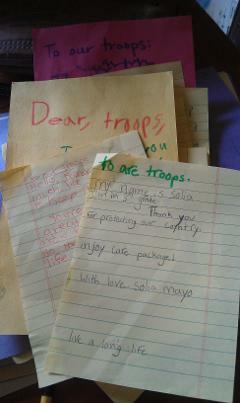 The kids kept busy waving signs, collecting fees, serving plates and writing letters to our troops. 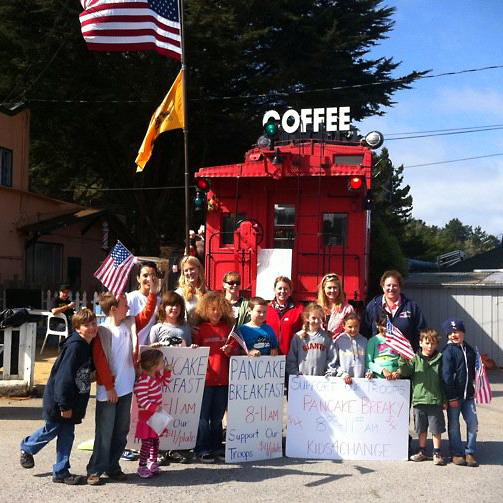 It was an enormous success and we want to thank all the Pacificans who came out to support us and our troops! But a special thanks to Pete, Solia, Christopher, Tyler, Cal, Lucca, Angel, Aidan, Arielle for their hard work, enthusiasm and for making a little change! In this first, mixed-age K4C project, the children eagerly voted to do a bake sale to support our local victims of the gas main explosion in San Bruno, just over the hill. Thanks to Gorilla BBQ for letting us camp out in the rain and providing us a space to sell. We raised over $150, which will be shared between San Bruno Fire Victims Fund and a project in Haiti via Kiva.org. Great job to all of the kids involved, especially those new to our group! The Kids 4 Change voted to sponsor a book drive to save paper and save trees. 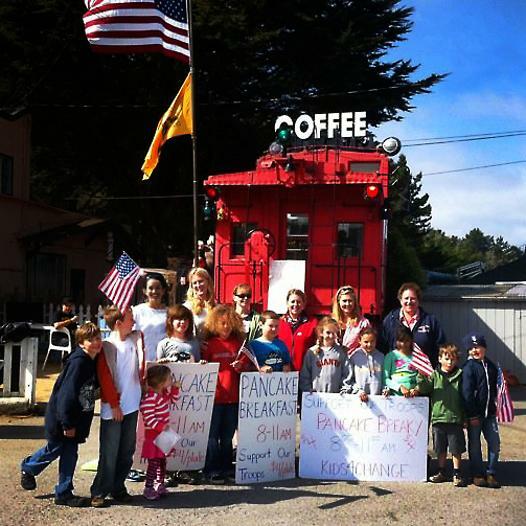 Proceeds were donated to a local conservancy to help save several 100 year old heritage trees in Pacifica. Remaining books were donated to the Pacifica Resource Center and local schools. Thank you to the large number of kids who participated in this project! You should be proud of yourselves! 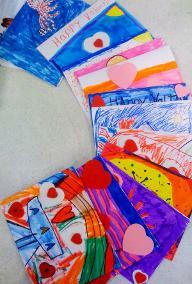 To kick off our valentine- themed project, the kids voted to make valentines cards to sell in the community. The kids made extra cards to deliver to the Pediatric Cardiac Unit at Stanford hospital to help some of the kids there feel better! Thank you to Lucca, Isaac, Kaiya, Sylvana, Peter, Nate, Calvin, Tyler, Evelyn and Solia for your creativity and beautiful efforts to put smiles in people's hearts! And a special thanks to Ocean Shore School for participating in our card-making project! We hope it increases awareness of this disease and that teachers and kids alike had fun doing it! six bags of trash from our beautiful coastline. This project the kids decided to knock on doors in their neighborhood and raised over $135 to be split between Habitat for Humanity and three small businesses in Africa via Kiva.org, a microlending organization. Everyone was a little wet at the end, but all the kids felt good about helping our community and environment. Congratulations Kids 4 Change: Kaiya, Nate, Peter, Lucca, Calvin, Isaac, Solia, Sylvana for helping make a great change! And to their helpers: Paige, Keaton, Ely & Hudson for such fabulous support! 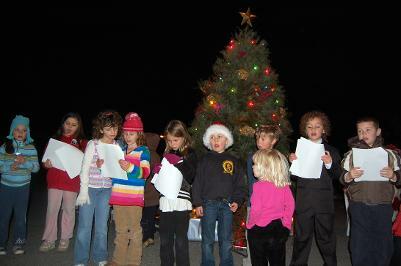 Kids 4 Change got in the holiday spirit this year by caroling for a cause. Everyone had a wonderful time at the holiday party and singalong, all while raising over $300 for My Two Front Teeth and kiva.org. Thank you to Julia, Aidan, Peter, Calvin, Solia, Arielle, Lucca, & Angel for brightening the lives of others!! And thank you to Pacifica Mayor Julie Lancelle who made our awards ceremony extra special! 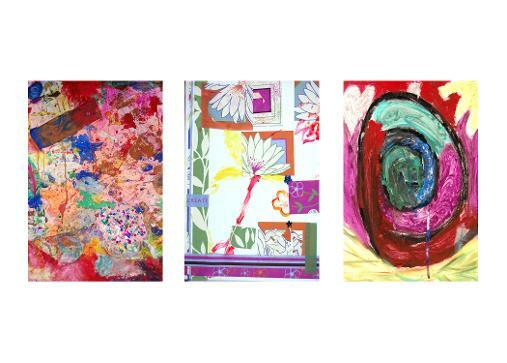 The kids voted to make artwork to sell locally and brownies to make it more fun! Thanks to Salada Cafe who displayed the artwork. 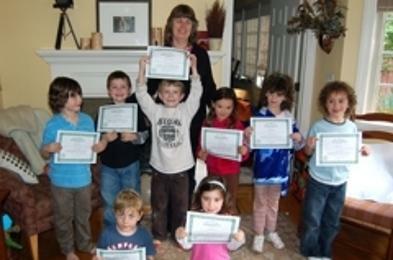 The children raised several hundred dollars and donated half to the Global Fund, and half to Kiva.org. Congratulations Arielle, Solia, Calvin & Peter for making the world a more beautiful place!